Hello! I am the author of THE OYSTER THIEF, an underwater fantasy novel with themes of ocean conservation. The book features a bright, beautiful world of merpeople. I am also the author of critically acclaimed PROJECT ANIMAL FARM, a work of global investigative journalism about the world's food system. I live in Toronto and maintain a website and monthly newsletter at www.soniafaruqi.com. To ask Sonia Faruqi questions, please sign up. 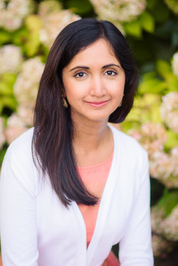 Sonia Faruqi I’m fortunate to say that I’ve never had writer’s block! Rather, I find that I have too much to write about. We’d love your help. Let us know what’s wrong with this preview of The Bear and the Nightingale by Katherine Arden. We’d love your help. Let us know what’s wrong with this preview of The Art of Racing in the Rain by Garth Stein. We’d love your help. Let us know what’s wrong with this preview of Paris Times Eight by Deirdre Kelly. I loved Ballerina by Deirdre Kelly. It is a thoroughly researched treatise on the life of a ballerina over the centuries. I am a fan of ballet but had never realized before this book the struggles that ballerinas face in their careers. Ballet is curre I loved Ballerina by Deirdre Kelly. It is a thoroughly researched treatise on the life of a ballerina over the centuries. I am a fan of ballet but had never realized before this book the struggles that ballerinas face in their careers. Ballet is currently associated with Russia but, interestingly, it began in France. Ballet started off as a realm of males before women also became dancers. But women ballet dancers straddled a fine line between courtesans and artists in the way society perceived them. They faced many hazards in their profession—sometimes, they literally caught fire. It was particularly heartbreaking to read an account of a talented ballerina called Emma whose dress caught flame and who suffered grave burns over the expanse of her body, eventually dying a tormented death. Today, ballet continues to be a tough field. Dancers are paid little and have careers that culminate at thirty years of age. Facing criticism of their bodies and a relentless pressure to be slim, they can also develop eating disorders. We’d love your help. Let us know what’s wrong with this preview of Ballerina by Deirdre Kelly. I loved Philip Lymbery’s earlier books Farmageddon and Dead Zone, and so was excited when a friend gifted me a copy of Mr. Lymbery’s Farmageddon in Pictures (2017). Mr. Lymbery is CEO of leading animal welfare organization Compassion in World Farming, I loved Philip Lymbery’s earlier books Farmageddon and Dead Zone, and so was excited when a friend gifted me a copy of Mr. Lymbery’s Farmageddon in Pictures (2017). Mr. Lymbery is CEO of leading animal welfare organization Compassion in World Farming, which combats factory farming at a global level. Farmageddon in Pictures is a concise, photography-filled version of Farmageddon. It contains the same incisive reporting, fairness, and depth.